You’ve probably heard of the 30% rule when it comes to deciding what kind of mortgage you can afford. You can also use this rule of thumb when figuring out how much rent you can afford. This rule basically states that you should spend no more than 30% of your income on your housing expenses. For best results, base it on your net (after taxes) income, and include your utilities in the cost as well. So, if you make $3,000 net a month, then your total rent plus utilities should be no more than $900 each month. Using this rule of thumb can help you choose a rental that isn’t too expensive for you in the event that you end up strapped for cash. It can also help you avoid having everything so wrapped in your rent that you can’t afford other things. What Can You Do If Rent is Too High? One of the issues you might have in the quest to figure out how much rent you can afford is that you might have trouble finding what you want for what you can afford. This is especially true in areas where there is a high cost of living. Live farther away from the main part of town and take public transit in so that you can live in a cheaper apartment. Find roommates. One of the most effective things you can do is split the cost of living in an apartment. If you can get a roommate or two to share the cost of rent and utilities, then you can reduce your cost. Just make sure that you can trust your new roommates, and make sure that having roommates is allowed by your lease. Move back home. Another option is to move back home with mom and dad. If you are having trouble getting on your feet, it can make sense to go back home and live for free — or very low cost. Get things figured out, and then look for an affordable living situation. Another possibility is negotiating the rent. If you are having trouble affording the rent in your area, you can see if there is something you can do to offset some of the costs. Can you be the on-site manager for an apartment complex? You might get free rent if you are willing to do so. If you have skills that allow you to help maintain the rental property, you can negotiate with your landlord to knock off some (or all) of the rent in exchange for your abilities. 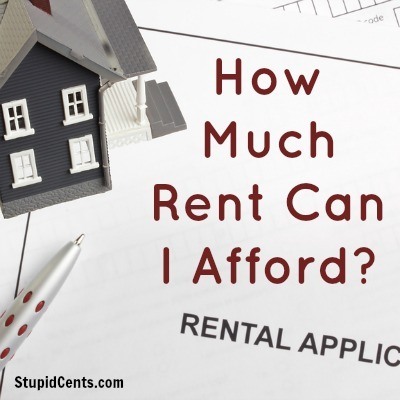 There are options for you if you are having trouble figuring out how much rent you can afford. Think about what’s available to you, and get creative about the situation. You might be surprised at the ways you can get your rent down to something manageable. I think Suze Orman’s advice about purchasing a home or renting really is key-Live beneath your means. We have lived this way for a few years now, and we are starting to see the difference it has made as far as our debt goes.